Worldwide Sports Fishing - Providing Incredible Fishing Adventures Around The World! A normal fishing day runs from 5:30 AM until 6:00 PM. 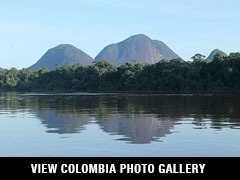 Anglers are paired two to a boat with an experienced Colombian guide. Usually, you will be fishing from narrow-hulled 20 foot traditional flat bottom boat with a short-footed 6 to 20 h.p. outboard. These boats are very stable with two bass seats and can cruise over shallow sandbars and flats and get you into places other boats cannot reach. The most exciting aspect of peacock bass fishing is its propensity for annihilating large topwater plugs or flies. When topwater activity slows, switch to a jerk bait or jungle jig, or you may downsize the large topwater baits to more traditional sized baits like we use in Florida. $1500 per person. May be paid with check, credit card, certified check or money order. Final payments are typically due 60 days prior to departure. Our travel agency can help with your flight arrangements. Note: airfares may change until final booking. Air fares into Bogota are running $300.00 to $600.00. Any changes are subject to the airlines rules and baggage restrictions. Please consult us as to the bag resctrictions for this trip. International airfare and airport departure taxes, fishing tackle, tips, gifts or items of a personal nature. You'll depart from Miami or Ft. Lauderdale on your international flight to Bogota, Colombia. On arrival, you be transferred to the Hotel. The next morning you will transfer to the domestic airport and be transported by plane and/or express boat to camp. 6 to 8 anglers per week. One angler per cabin. Each cabin offers one queen sized comfortable beds, fans and overhead lighting. The camp typically accommodates 6 anglers. There is no need to overpack, as laundry service is available. Breakfasts are hearty. You'll typically take a one hour midday break to enjoy a lunch that you prepare early that morning from a variety of deli meats. Dinner is served at the camp around 7:00 PM and features a tasty array of chicken, steak or fish. Day 1: Depart Miami or Ft. Lauderdale in the afternoon (many airlines are available to take to Bogota). Arrive into Bogota. Transfer to Hotel. Overnight. Day 2: Fly to a small landing strip, transfer to an express boat, 3 hour boat ride to camp. Orientation. 1/2 day fishing, time permitting. Overnight at camp. Days 3-7: Full fishing days. Overnight at camp. Day 8: Time permitting fish the morning then return via boat to small landing strip and then return to Bogota by flight, transfer back to the hotel in Bogota. A valid passport with at least six months validity is required for U.S. citizens. No visa is required by Colombia. Passengers assume all responsibility for obtaining valid passports. Malaria tablets recommended. Be sure to bring sunscreen and insect repellent. Drink plenty of bottled water to keep yourself hydrated. Note: health precautions are offered here as an informational service only. See your doctor or health clinic. The official language in Colombia is spanish. The camp host speaks English. Some of the guides have a very basic working knowledge of English with respect to fishing. Learning a few key words in the host country's language may prove beneficial and your efforts to communicate will be appreciated. Daytime temperatures typically range from 80-100 degrees during the day, but typically cool down to the upper 60's in the evening. Heavy tropical downpours can occur even during the "dry season" so be sure to pack a rainsuit. Humidity in the tropics can play havoc with cameras or other electronic devices. We recommend you purchase trip cancellation insurance to cover any losses should you have to cancel to due to unforeseen illness or other emergency. Certain restrictions do apply. Premium rates are typically about $65 per $1,000 of coverage, and usually include some benefits for lost baggage, trip interruption, and emergency evacuation. Forms for Travel Assure may be obtained by calling our office. Our recommended packing list and other briefing materials will be furnished on receipt of your trip deposit and reservation form. Information in Trip Details is subject to change without notice. Worldwide Sport Fishing, Inc. is not responsible for any unintentional omissions, or erroneous information which may be provided by the local operator.